For a permanent experimental record or for an easier interpretation of results when testing multiple samples, the solid red area may be cut off the bottom of the strip to prevent further band development once the positive flow control bands have appeared. A gentle stream of air can be applied to the membrane portion of the strip to assist in drying the membrane and preventing any further development. Do not wash the strip to stop the reaction. The rat monoclonal antibody isotype test is used to determine antibody isotype, which has implications on functional activity, purification strategies and long-term stability. This isotype kit, using dip-stick technology, gives you accurate results in under 10 minutes. The rat monoclonal antibody isotyping test kit shows no cross-reactivity with bovine IgG (<0.1 %). 1 Desiccant vial containing rat isotyping test strips, 10 tests. 10 Capped ready-to-use lyophilized microparticle development tubes. The assay principle is based on mouse polyclonal anti-rat antibodies coupled onto coloured micro particles and equally reactive to any rat monoclonal antibody regardless of its isotype. The isotyping strip has immobilized bands of monoclonal mouse anti-rat antibodies corresponding to each of the common rat antibody isotypes (IgG1, IgG2a, IgG2b, IgG2c and IgM) and to kappa light chains only. One side of the strip bears a positive flow control band, which indicates that the antibody-coated coloured micro particles have migrated through the strip. By using these two components, a rat monoclonal antibody can be screened for isotype by simply diluting the antibody sample, pipetting the diluted sample into the development tube where it forms a complex with the antibody coated micro particles, and inserting the strip. This complex flows through the strip until it is bound by the immobilized mouse anti-rat antibody specific for the rat monoclonal’s isotype and its light chain. In approximately 5-10 minutes, the micro particle complex will aggregate as blue bands in the two sections corresponding to the monoclonal antibody's isotype and its light chain. Development of the strip is complete when the positive flow control band on one side of the test strip turns blue. Do not use components from different lots. No heavy and or light-chain band appeared on the strip, but the positive flow control bands appeared. 1. The antibody concentration was too low - prepare a less dilute sample and re-test. 2. No antibody was in the sample - the hybridoma is either not secreting or is not a rat monoclonal. If possible sub-clone the hybridoma and re-test. 3. Freshly diluted samples were not used - prepare fresh dilutions and re-test. Multiple heavy and light-chain bands appear on the strip. 1. Antibody concentration was too high - dilute sample further and re-test. 2. For ascites, there may be small amounts of contaminating antibodies produced - dilute sample further and re-test. 3. For tissue culture supernatant, a mixed culture may be present - re-clone the hybridoma and re-test. No positive flow control bands appear. 1. Sample volume was too low (<150ul) - carefully dilute a fresh sample and pipette 150ul into a new development tube and re-test. 2. Strip removed from development tube too early - re-test and allow strip to react for at least 10 minutes. Typically, serum contains between 10-15 mg/ml IgG and ascites can be as high as 10 mg/ml . Hollow fibre bioreactor culture supernatants contain approximately 0.5-1.0 mg/ml, whereas static flask tissue culture supernatants usually contain 10-50 ug/ml. Using these estimates, the appropriate dilutions can be made. 1. Remove the required number of isotyping strips from the desiccant vial and replace thecap. Remove the caps from an equal number of development tubes. Note: the tubes may be labeled with a marker for identification. 2. Pipette 150ul of the freshly diluted sample into each development tube and incubate at room temperature for 30 seconds. Vortex the tube briefly to ensure that the coloured micro particle solution is completely re-suspended. 3. Place one isotyping strip, with the solid red end at the bottom, into each development tube. Interpret the results at 5-10 minutes once the positive flow control bands have appeared. Within 5-10 minutes, a blue band will appear above the letters in one of the class or subclass windows as well as in the kappa window of the strip, indicating the heavy and light-chain composition of the monoclonal antibody (lambda light chains are very rare in rat monoclonal antibodies, but if present no positive band will be seen in the kappa window). The intensity of the blue bands will increase as the sample continues to flow up the strip. 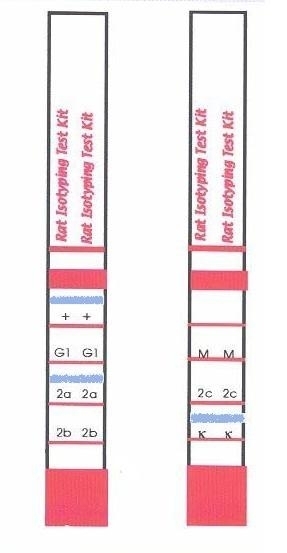 The positive flow control bands on one side of the isotyping test strip should also appear, indicating that the antibody-coated micro particles are functional and have flowed up the strip. In cases where the sample is very dilute, the development time may take up to 10 minutes. Esashi,E. et al (2004) Development of CD4+ macrophages from intrathymic T cell progenitors is induced by thymic epithelial cells. Taylor, P.R. et al. (2005) Dectin-2 is predominantly myeloid restricted and exhibits unique activation-dependent expression on maturing inflammatory monocytes elicited in vivo. Balyasnikova, I.V. et al. (2005) Monoclonal antibodies to native mouse angiotensinconverting enzyme (CD143): ACE expression quantification, lung endothelial cell targeting and gene delivery. Kato, M. et al. (2009) Production of monoclonal antibody specific for bottlenose dolphin neutrophils and its application to cell separation. Dev Comp Immunol. 33 (1): 14-7. Sawano, S. et al. (2016) A One-Step Immunostaining Method to Visualize Rodent Muscle Fiber Type within a Single Specimen. PLoS One. 11 (11): e0166080. Fichou, N. et al. (2015) Single-Dose Anti-CD138 Radioimmunotherapy: Bismuth-213 is More Efficient than Lutetium-177 for Treatment of Multiple Myeloma in a Preclinical Model. Front Med (Lausanne). 2: 76. Hibi, T. et al. (2009) Splicing variations in the ligand-binding domain of ApoER2 results in functional differences in the binding properties to Reelin. Neurosci Res. 63 (4): 251-8. Fukuhara, T. et al. (2006) Functional analysis of nuclear pore complex protein Nup62/p62 using monoclonal antibodies. Hybridoma (Larchmt). 25 (2): 51-9. Koide, A. & Koide, S. (2007) Monobodies: antibody mimics based on the scaffold of the fibronectin type III domain. Methods Mol Biol. 352: 95-109. Tanaka, M. et al. (2016) Identification of low-abundance proteins in serum via the isolation of HSP72 complexes.